On the occasion of the 70th Anniversary and of the sixtieth year when Portugal joined the organization, the President of the Republic addressed a message to Ban Ki-moon, UNO Secretary General. In the year when the United Nations celebrates the 70th anniversary of the signing of the San Francisco Charter, Portugal commemorates the sixtieth year of its joining that Organization – a unique institution in the contemporary world in its purpose to ensure international peace and security, respect for human rights and promotion of sustainable development. Throughout my mandates, I have attributed primary relevance to the United Nations and to the UN System, and took part in several General Meeting opening sessions and presided at a debate of the Security Council. I was very pleased to be able to support and witness the success of Portugal’s election to, and its performance in the Security Council and, currently, in the Council for Human Rights, as reflecting my Country’s international credibility. Still within the framework of the United Nations, I stress the importance of the Oceans’ theme, as strategic for Portugal, considering our geographical location and our identity, and in the outlook of our history and our future. I equally emphasize the priority that should be provided to the promotion of the Portuguese language within the United Nations System. It is the official or working idiom of several of its specialized committees and CPLP will continue defending its recognition as an official language in the United Nations. 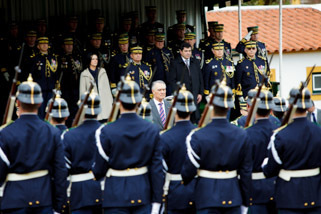 As Supreme Commander of the Armed Forces, I stress the contribution of the Portuguese military and of its security forces which served and continue serving the United Nations peacekeping operations, thus bringing prestige to Portugal.